Last Thursday was the first annual Harry Potter Book Night, and I was part of the team that organized and delivered a big event at my library. Harry Potter Book Night was started by Bloomsbury “to share the wonder of J.K. Rowling’s unforgettable stories and, most excitingly, to introduce the next generation of readers to the unparalleled magic of Harry Potter”. While there's a marketing impetus behind it, especially in light of the books’ recent rerelease with lovely new cover art, the event also proved a perfect opportunity to celebrate the pure fannish joy of loving something along with other people, and I love that libraries and schools were explicitly invited to take part. There are books I love far more than Harry Potter, but the series still means a lot to me. Although I was in my early teens when I started reading them, I still feel like I grew up with them, and I really enjoyed sharing the anticipation and excitement of each new book with other fans over the years. I never attended a midnight release because none ever happened near me (sob), but I still really enjoyed hearing about them. To me, Harry Potter Book Night was about recreating that sort of experience for readers too young to have been around for the original release parties. It was also about fannish excitement, community, a shared love of stories, and unapologetic bookish enthusiasm — in short, all the things libraries are all about, and are ideally placed to foster. Also, I got to play dress up for work! What’s not to love? Four of the members of my Pre-Teen reading group were at the event, and I think they particularly enjoyed seeing an adult they know be shamelessly geeky alongside them and dress up as a Hogwarts professor. Also, although our event promotion highlighted dressing up, we didn’t want to make it mandatory for all the obvious inclusivity reasons, and we didn’t know how many people would join in. I’m thrilled to say that the vast majority did, though — we had everything from fancy Hogwarts uniforms to homemade costumes to drawn-on Harry Potter glasses and lightening-shaped scars, and they were all absolutely lovely to see. This was the biggest event I’ve been involved in organising to date, and I was lucky to work with an excellent team of people who are great at all the crafty stuff I’m hopeless at. We didn’t have much in the way of a budget, so all the decorations had to be made with whatever craft materials we already had. I think we did a pretty impressive job of temporarily turning the children’s library into Hogwarts: it’s a big space, so you need a lot to change it in a noticeable way and create the right sort of atmosphere, but I think we got there in the end. In addition to working on the decorations, I was in charge of creating a Harry Potter readalikes poster/leaflet for children and for teens, as well as putting together a book display. Naturally this included ALL the Diana Wynne Jones, and also Ursula Le Guin, some Eva Ibbotson, and the Graceling Realms books in the teen version. I also did an informative leaflet about the Harry Potter fan community and all the things organizations like the Harry Potter Alliance have used their energy and passion to achieve over the years. The space we had available could safely accommodate a hundred people, and the event was fully booked weeks in advance. I hope its success will give us the opportunity to host more themed parties for popular book series and/or fandoms: they’re obviously popular, and they’re such a fun way to engage with our children and teens. But what did we actually do, you ask? Well, we played Harry Potter trivia and a Potteresque version of musical statues; we had dramatised readings from the first book; we held a Lucky Ticket raffle; we gave people the opportunity to take in the decorations, look at the displays, admire each other’s costumes, and do the crafts and other activities (more on which below); and we finished the evening with a group performance of the Hogwarts School Song — with an imposed tune rather than everyone singing it to their favourite one, I’m afraid, because as much fun as that would be it would probably result in complete chaos (the tune we used is stuck in my head to this day). I had a ton of fun asking colleagues to pose for the “Have You Seen This Wizard?” posters. A flock of Golden Snitches. 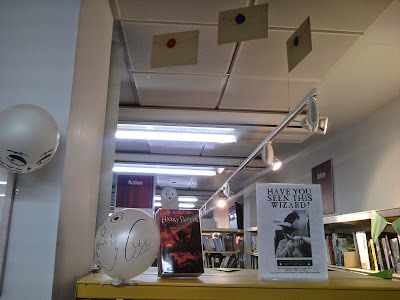 In addition to using them as decorations, we used "Make your own letter from Hogwarts" (with plasticine for the seals) as a craft activity, and it proved very popular. Prizes for our games and for the Lucky Ticket raffle. My Teen “Done with Harry Potter?” display. My colleague’s brilliant house banners and bunting. We created colour-coded corners for each of the four Houses and people seemed to really enjoy them. Because of course. This was a photo posing area and it was busy all through the evening. 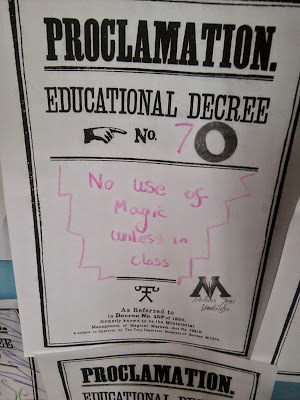 We also invited people to come up with their own absurd Educational Decrees, and that was another popular activity. Possibility my favourite: “All students must drink hot chocolate with marshmallows and whipped cream before bed”. Why not take a bad thing and turn it into a good one? 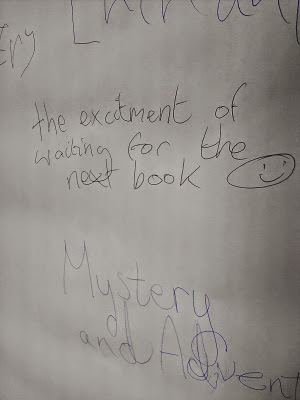 ...“The excitement of waiting for the next book”. My friend retiring to Hogwarts at the end of the evening. I think by then we all deserved a holiday there. What fun, so many imaginative touches! And yay for plugging DWJ and other books. There's a world of reading beyond Hogwarts, kids. This looks like so much fun! While not having a budget causes hardship, the creativity that results from having little money always impresses me. Fabulous. So fabulous. I am jealous. This looks so well planned and so, so much fun. Love the creative decor -- we also have to create with no money ;) Hurrah to all for all this hard work. Thank you so much :D It was a ton of work, but it left me feeling really energized and really positive about work, which is always a lovely feeling. And I have all these ideas for more fancy dress events we could do - I'll be sure to post about it if they come to fruition! Those cat plates are fantastic! And the owl balloons are a brilliant idea. Aren't they? I'm lucky to have colleagues who can draw so well, because I'm a disaster at it :P I was super impressed with how well they worked. This is so wonderful, Ana! Loved your post and enjoyed looking at the pictures. It was so nice to see the Hogwarts Express and the Platform 9 3/4 :) Also the books that you have displayed - I am planning to look at them more closely soon and read some of them. Congratulations on organizing this wonderful event - it looks like it was a beautiful and wonderful evening! Thank you :D I really enjoyed working on it, and as I was telling Melanie above, it left me feeling energized and excited about organising more things. wow you've done an amazing job! so many details, no wonder people loved it. Everything looks amazing! It sounds and looks like y'all did an amaaaaaazing job! I DID go to midnight release parties, cause there always were some -- I was in Croyden for the sixth book's release, and my main memory is how pleased everyone was to be queuing up. I heard more than one person in line say "Oh goody, I love queuing." BRITAIN. What clever ideas, it all looks like so much fun! Thank you :D It was a blast. Wow! Love all the decorations. The Hedwig balloons are brilliant. And the Umbridge plates made me laugh. I bet a good time was had by all! I think it was :D And thank you so much. what a truly lovely and magical event it seems to have been. your patrons are indeed blessed to have you be their librarian. thank you so much for sharing! Aww, thank you - that was lovely to hear. Oh I love this SOOOO much!!! And you look so damn adorable! I so wish that I had a librarian like you when I was growing up :) Those kids are so luck to have you. And it looks like you had a lot of fun too :D This brought me down memory lane of reading all the Harry Potter books as they came out. I think I'm going to get the new illustrated ones as they come out and reread them all! Thank you, darling <3 PS: Anticipating the last book with you and Dewey and others is a memory I'll always treasure. So aweome and so much fun!! I would've had a field day if I was part of a group that organized Harry Potter nights! I'm really lucky to get to do what I do, and I especially feel it at times like this. 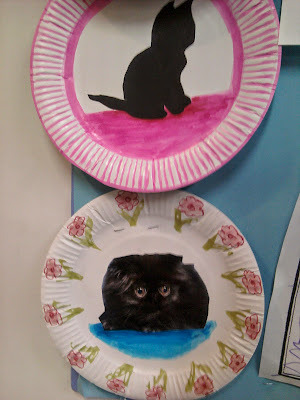 The kitten plates are the photo that sent me into out-loud laughter! Thank you and likewise! I loved seeing your photos, and pairing the owls with the letters was a great touch. This is amazing, Ana! It definitely has the same feel as the two release parties I attended, and it looks like you made it really easy for everyone to participate. I'm so impressed. <3 Thank you and that is excellent to hear!